Although he notes that most scholars accept an Alaskan origin of Thule Culture, Oleson neither presents their case nor a comprehensive rebuttal of it. His basic claim that the oldest Thule sites are to be found in Greenland and the youngest in Alaska is not documented and is not supported by archaeologists. — William E. Taylor, Jr.
Manitobans sometimes forget that their province has an arctic frontier and that Inuit (Eskimo) peoples have played a role in its history. An interest in the arctic and its peoples came naturally enough to Manitoba scholars of Icelandic extraction whose own roots lay “in northern mists.” Two such scholars courted controversy during their lives because of their respective views of the arctic. The most famous of these was Viljalmur Stefansson, who was born at Arnes Manitoba and who made a major contribution to our understanding of the north through his arctic explorations and his large body of publications. Less well known is Tryggvi J. Oleson, a native of Glenboro, Manitoba, and an outstanding medieval historian. His views of arctic history and in particular of the genesis and nature of Thule culture, advanced in his book Early Voyages and Northern Approaches, led to a genuine controversy in Canadian social science. Despite notices to the contrary Oleson’s views were by no means new, and his synthesis of many earlier contributions was an attempt to stimulate an interest in a neglected European arctic history. When Professor Oleson of the University of Manitoba published Early Voyages and Northern Approaches in 1963 as volume one of the new Canadian History Centennary Series, there were high expectations in the scholarly community. This series is only now being completed and the general contribution it has made to Canadian historical writing has not been disappointing. Nevertheless it came as something of a shock to D. G. Creighton and W. L. Morton, the original editors of the series, when Professor Oleson’s volume met with a good deal of critical hostility. The book dealt with the earliest years of recorded Canadian history, covering the period 1000 to 1632 A.D. The major criticisms were focused very much on Oleson’s interpretation of the archaeological record, particularly with respect to the origins and character of Thule Eskimo culture. The editors of the series were faced with a difficult situation owing to the untimely death of Professor Oleson in the same year his book was published. While he had been well aware of the views of many of his critics, there was in fact no occasion for him to reply. When a reprint edition was contemplated in 1968, the editors decided to include selected excerpts from the major reviews in the form of a new introduction, and as a kind of caveat to readers. The text itself was left unaltered. At the time, this may have seemed a reasonable approach to a book which was intended to serve as a general introduction to Canadian history for students and the interested lay reader. In retrospect, the result may have been to bury Oleson’s thesis rather than stimulate discussion of its many aspects. The reviews tended to leave the impression that there was nothing more to say about the main thesis. The present paper seeks to place Oleson into a context of enquiry little acknowledged by his critics. This tradition of thought had its roots in the eighteenth century and peaked in the twentieth century writings of Fridtjof Nansen, Viljalmur Stefansson, and Jon Duason. This body of thought put forth propositions and suggestions not consistent with the general arguments of many archaeologists. The main issues raised by Oleson’s critics in the mid-1960s concerned his understanding of the forces which led to the genesis and spread of Thule culture in the centuries after 900 A.D. Also under review was his interpretation of certain bodies of ethnological evidence, particularly with respect to an arctic population known as the “Tunnit.” Finally, his notion that Thule peoples received a strong imprint from an ongoing cultural and racial mixing of old Norse Greenlanders with resident Eskimo or Eskimo-like peoples was generally rejected. The comments of some of the reviewers were heated, but before entering into the controversy, it is important to note some assumptions which were commonly held by many arctic scholars in the early 1960s. The establishment of knowledge about the existence of several cultures in the high arctic, particularly in the Bering Sea area, between 8,500 B.C. and 800 A.D., was based largely on post-World War II studies. There is still much debate about the relationship of the ancient micro-blade users and later practitioners of the “arctic small tool” traditions. Were these micro-blade users people of Indian stocks from the forests to the south, or were they more properly ancestors of arctic peoples well adapted to tundra and coastal conditions? The manner in which archaeologists introduce important new distinctions is usually on the basis of material culture analysis. This was certainly the case in 1925 with respect to Jenness and the Dorset. Jenness compared the nature of the harpoon heads which were characteristic of the Thule Culture with those he was inspecting from Cape Dorset. Thule harpoon heads had holes in them (for thongs) which were clearly drilled. The unfamiliar Dorset types had holes which were merely gauged out. Other distinctions have been added over time. For example, it appears that the Dorset peoples did not have the use of dogs for the pulling of sleds, a fact of great importance in any consideration of the general mobility of the Dorset. As soon as the Icelandic hunters or boothsitters, that is, the Tunnit, began to migrate from the farming settlements, they came upon the aborigines in Northern Greenland and the islands of the Canadian archipelago. These aborigines were the Dorset people ... The inter-mixture between the Icelanders and these more primitive people, which must have begun as early as the eleventh century, was to lead to the development of a new and distinctive culture and the evolution of a new people - the true Eskimos who spread from Greenland in the east to Siberia in the west. This development, from which the modern Eskimo culture has evolved, is known as the Thule Culture. In short, the long and drawn out decline of the European-style Norse Colonies in Greenland was to be explained not by some Eskimo conquest or by the effects of disease and climate change, but by the natural inclinations of a group to adjust their economy and way of life to one more appropriate to arctic conditions. The Norse, according to Oleson, had slowly gone native. The scholarly community by and large would have none of this, and many of the reviewers had a field day. This led to the reprint publishing dilemma referred to earlier. Among the reviewers, the one who displayed the least patience with Oleson’s thesis was the renowned archaeologist and participant in the Fifth Thule Expedition, Therkel Mathiassen. 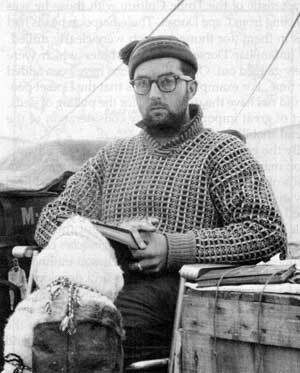 Mathiassen himself had been responsible for the identification and definition of the Thule Culture through his work at Thule Greenland during the Second Thule Expedition, and at Naujuan in Repulse Bay during The Fifth Thule Expedition. His report on the Naujuan finds has been considered a classic statement in Central Eskimo studies. Clearly, Mathiassen’s views were important. Concerning Oleson’s synthesis, he contended that “the large section on the history of the Eskimos and on the relations between the Eskimos and the Norsemen in Greenland must be said to be completely misleading.” According to Mathiassen the author had taken “at face value the extremely fanciful book about this problem written by his compatriot Jon Duason.” On Oleson’s identification of the Tunnit with the Norse, Mathiassen contended that “there is nothing whatsoever in the stories of the Tunit which points to the Norseman.”  These pronouncements are hard to reconcile with the close documentation provided in chapter eight of the Oleson volume which draws heavily on the accounts of Boas, Hawker, Rasmussen (the guiding light of The Fifth Thule Expedition) and others. That speculative reconstruction embodies so many errors that a critic might despair of listing them in detail. Perhaps it will suffice to say that there is no evidence of a Norse-Dorset blending ... that there is no evidence that the Canadian Thule culture people were racially blended with Caucasoids, and that there is no reason to believe that the Thule culture began earlier in Greenland than in Alaska. The history of the early Norse settlements in the New World has always been shrouded in mystery. It remains shrouded. Professor Oleson, before his untimely death, wrote this provocative interpretation which adds another voice to the confused chorus that has sought to establish what happened to the first European settlements in the New World. The chorus is a confusion of tongues and disciplines as well as of theories. No one scholar has yet appeared who can bend the bow of anthropology, history, and linguistics to the degree necessary to exploit fully the scanty remains, literary and archaeological, of those settlements. The evidence drawn from the Tunnit legends, while important, was not the main body of evidence which interested Oleson when looking at Inuit origins. Tangible archaeological remains and architectural survivals were much more important. A central preoccupation of enquirers into the character of Thule culture was the relationship of that group with the sea, especially the development of the material-culture base which could support a sophisticated sea-hunting culture. The origins of that material-culture base was the point on which Oleson parted company with much conventional scholarship. In so doing, he also revived and extended an older tradition of enquiry and interpretation. This older tradition of enquiry was at odds with the general model developed by archaeologists in the early 1960s. Oleson, as a medievalist, argued for strong pre-Columbian European influences on the high arctic. North American arctic archaeologists, by and large, had been preoccupied with Siberian origins and influences, and generally minimized medieval European effects. This difference in perspective was important in the debate and can be readily noticed through a brief review of how Thule culture was normally evaluated by archaeologists. The topic of whaling was central to the arguments archaeologists had made since the 1920s to explain the rise of Thule culture in the period around 900 A.D. Questions concerning the nature of a whale-hunting tool-kit appropriate to the capture of the larger species of migrating whale (particularly the Bowhead Whale and the Right or Balleen Whale) were converted into a series of questions concerning the origins of such a way of life. Models were sought which might explain the relative rapidity of its alleged rise and spread. These questions were introduced into a context which still lacked much solid archaeological data relative to the vast landscape under consideration. Old-world models became useful and necessary aids to reflection. In the first half of the twentieth century therefore, there had been much interest shown in the probable affiliation of the Eskimo peoples with old-world cultural hearths. There was the possibility for example, that the Eskimos might represent late survivors of the mesolithic hunters and cave-artists of ice-age western Europe. This became a progressively less satisfactory model owing to the large time-frames involved and the general lack of sequential evidence required to confirm such a hypothesis. Now that excavations have been made in the American Arctic and Siberia the postulated cultural affinities between Eskimo and Paleolithic appear in a different light. The recent excavations have produced new and unexpected evidence of relationship between the older Eskimo cultures, the early Siberian Neolithic, and European Mesolithic. Tryggvi Oleson agreed with these general proposed dates of origin, but his ideas on the location of the original hearth were radically different from those of most scholars. In suggesting that Thule culture came about largely as the by-product of a long-standing process of admixture between old Norse people and the Dorset peoples, Oleson developed an eastern arctic cultural hearth, and dismissed the notion of a western arctic origin for Thule peoples. For a scholar to undertake such a total revision of the conventional wisdom a deep and sustained contemplation of sources was required. Similarly, one would expect reviews of such a work to do justice to the author’s use of the sources. A reading of the reviews is disappointing in this regard, for one is left with the impression that a long and careful inspection of a wide range of materials by Oleson was dismissed out of hand. In particular, many of the reviewers missed the essential point: Oleson’s revision was based largely on a reinterpretation of the writings of the archaeologists themselves. While the writings of Jon Duason were important on literary and linguistic matters, they were not the major source for Oleson’s ideas on the general sequence of arctic events or for his knowledge of the archaeological record. The archaeological literature of Oleson’s time, as he interpreted it, was hard-pressed to explain the relative lack of material items indicative of a presumed whaling way of life at the Birnirk sites in Alaska, even though these sites were supposed to give the key to the origins of Thule culture. In addition, Oleson found archaeological explanations of large scale movements of Thule peoples and influence in the period after 900 A.D. quite unconvincing. Oleson had drawn the conclusion that such movements could not be explained under the assumptions and rules of evidence which the archaeologists themselves had established; and so by his own marshalling of evidence he concluded that Thule had in fact received its strongest imprint in the eastern arctic. Having asserted that archaeological models of migration and early Alaskan influence were inconsistent, Oleson pointed to forms of evidence of a more literary nature than archaeologists had utilized. Never before to this reviewer’s knowledge, have the available documents, traditions, and potential sources of literary reference been mined so thoroughly or presented so clearly in English. The extent of the early migration to Iceland was estimated by the French historian Musset to have approached 30,000 to 35,000 people between 870 and 930 A.D. The subsequent colonization of Greenland opened up two major frontiers on the arctic. Oleson did not pursue his “historical vacuum” idea back into its European trade setting at great length, for that was not his purpose. Yet, looking in this direction might well increase the legitimacy of his initial observation, and it might amplify our view of arctic life in the period from 900 to 1500, particularly with respect to the traditional role of whaling in medieval Scandinavian society. Questions about the ultimate role of a north European cultural hearth for the Inuit can not be answered easily, and the complex history which unfolded in Scandinavia from the 6th millennium B.C. to the period of the Viking expansion in the 8th century A.D. cannot concern us here. What is of interest is the long and presumably unbroken connection with the sea which became part of the Norse identity and way of life down to our own day. For the Norsemen, harpooning whale was an old-established art. The older Gulating Law has two chapters on whaling regulations and is explicit on the subject of whale-hunting. The king’s Mirror gives detailed descriptions of various species of whale found in the Arctic Ocean, displaying a knowledge of these creatures such as could have been acquired only through generations of hunting. Thus, the ninth century penetration of the eastern arctic by a rump population of the most aggressive element in contemporary Europe, possessed of unmatched seafaring skills and long-accustomed to a life of trade, farming, hunting, fishing and whaling, must be taken as more than a minor event with respect to the traditional life-ways which had been developed by the widespread but highly localized groups then in possession of the North American arctic. The explanation that the Norse could not survive without supplies from Europe was formerly prominent, but archaeological excavations of Norse ruins have shown that the Norse were prepared for self-sufficiency. This is surely not surprising given the eclectic nature of Norse economy and its regional variants. In this Norse eclecticism may be found the key to Oleson’s radical thesis of 1963, for it was not merely the diversified survival techniques of the Norse that commanded his attention, but the temporal context as well, a context marked by a dynamic tendency to range far and wide. As to the question of cultural fusion between groups, the arguments presented in Oleson’s work were made from the perspective of material culture studies, architecture, ethnology literary sources and physical anthropology. Research since the 1960s has still not clarified the difficulties presented for those seeking to come to firm conclusions in many of these fields and no firm conclusions will be advocated here, particularly with respect to the difficult area of physical anthropology. There were, nonetheless, some remarkably inconsistent complaints made by some of Oleson’s reviewers. Mathiassen, who himself had done much to identify the historical emergence of a hybrid Eskimo-Norse variant culture in west Greenland (the Inugsuk), still felt it absurd to think Greenlanders would slowly abandon a domestic farming way of life for that of hunters. As has been suggested, however, this was not a new idea in Oleson’s work; as an hypothesis it had a pedigree dating back to the mid-eighteenth century. In more general terms, and from a Canadian point of view, the idea of hybridization between Native and European, and of the abandonment of colonial centres by Europeans for the life of the land, are fundamental themes of continental history from the seventeenth century onwards. There is no logical reason for assuming that such processes were not at work in the high arctic between 900 A.D. and 1500 A.D.
... the very force of circumstances obliged them [the fur traders] to accommodate the habits and associations of a millieu from which they did not find it possible to withdraw as they could on the coast. It was no longer a question of merely awaiting the arrival of the Indians and exchanging European goods for their furs; instead it became important that the personnel, if it did not wish to abandon the field to the Canadians, should learn from their methods and spread out among the native people. To what extent this would have been the case with the passage of time in the high arctic remains problematic as the regularity of trade expeditions with old Europe waned and then totally disappeared some time in the fifteenth century. Practical economy lay in the direction of the land and adaptation to native ways. Cutting up a whale. 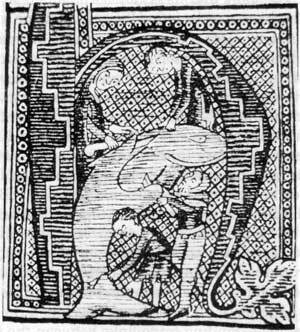 Woodcut from an Icelandic manuscript in F. Nanson, Northern Mists. At stake in the argument between Oleson and the archaeologists was the methodology to be employed in assigning meaning to the words “Thule” and “Dorset” and how they were related. Archaeologists have been very interested in finding sites which are “stratified,” that is, sites where a “Thule” site is found directly on top of an older “Dorset” site, and the “Dorset” site in turn is on top of an even older “Pre-Dorset” site. Such a situation occurs at Lake Harbour on the southern side of Baffin Island. Lake Harbour and other such sites tell us much about what kind of people occupied a given area and when they did so. The relationships between those peoples (if any) is much more difficult to establish. There is certainly room for questioning the assumption that a Thule-inspired “conquest” was underway more or less continuously across the arctic after roughly 900 A.D. If one is not wed to the notion that the only way technology advances is through migration, then a process of gradual refinement and adoption of new ideas and materials, stimulated by the presence of Europeans in possession of a powerful set of medieval technologies, located on the eastern periphery of the arctic, would be a sufficient explanation for the fairly rapid transformation and upgrading of the arctic tool kit. Longstanding trade relationships with the Dorset would provide the major mechanism for this process of idea-refinement, along with the selective and gradual admixture of Greenlanders “going native” in the face of declining opportunities to carry on the European way of life in settled villages. Oleson’s isolation of a frontier element among the Greenland colonists may prove useful for future analysis while some of the material he utilizes may very well point to a degree of assimilation of Norse individuals and culture traits in certain Eskimo groups notably in Baffin Island. But anything so sweeping as the alteration of Dorset Culture into Thule was not an idea Quinn was prepared to endorse. Nevertheless, arctic archaeologists were stuck with a problem: how to explain a radical shift in arctic lifeways which came about precisely in the time period when the Norse penetrated the arctic and the new world. This shift was not and still is not in dispute, and many projects and papers have been assembled in recent years by archaeologists on these themes. In particular, questions of Dorset-Thule succession have been studied at sites where there is a presumed sequence of the cultures through time. In his recent synthesis of eastern arctic prehistory, M. S. Maxwell tends to stress the continuities between Dorset and Thule cultures. With respect to hunting and the nature of the resources utilized, he sees a more efficient exploitation of a similar ecosystem taking place in Thule times. “Thule hunters were able to take advantage of more targets of opportunity.” Maxwell suggests that the technologically inferior Dorset may have become over-dependent on a hunting schedule which required a great expenditure of energy (in the absence of dog-sleds) to be at the correct place at the correct time in order to undertake successful hunting. This rigid system of scheduling may have been “a contributing factor to Dorset collapse when upset by intruding Thule hunters.”  It was Oleson’s contention however, that no such intrusion need be posited, for the relevant process was one emanating out of the east and it was not one of conquest but of gradual mutual learning and accommodation between two peoples already resident in the eastern arctic. This model is not inconsistent with what some archaeologists studying Dorset-Thule succession in specific localities have noticed. For example, E. Bielawski has argued on behalf of modification and reciprocal interchange between Dorset and Thule, and concluded: “The eastern Thule subsistence pattern increasingly came to resemble the Dorset patterns.”  These kinds of conclusions tend to reinforce the notion of localized change rather than positing large migratory movements of people as an explanation for cultural modification. On the other hand, if the Thule Culture originated as an iron age culture in Greenland and gradually spread westward to Alaska and Siberia, there is no problem in explaining the increasing excellence of its arts and artifacts. An iron age people increasingly cut off from sources of iron is driven to the manufacture of stone and bone implements and in the course of generations, masters this new technique. In other words, the bearers of the Thule Culture had to progressively re-adapt to the working of bone and stone as they moved towards the west, while the superior design elements which had been introduced under the influence of iron models were retained. With this way of life all better things would soon be forgotten, and now it might happen that a Norwegian born girl preferred an Eskimo Kayak paddler as a suitor and master, to a less successful family supporter of Norwegian descent. In such a process would have been found one of the beginnings of a new population. Unlike the situation in southern Canada where stimulation from the European heartland remained dominant, the situation in the arctic was reversed. There would be strong forces leading Scandinavian women, as well as men, to go native. 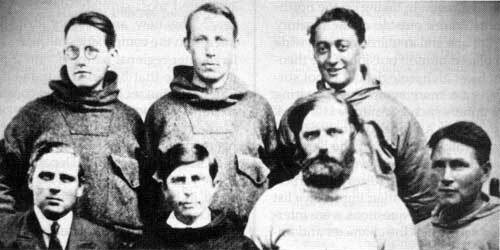 Members of the Fifth Thule Expedition. Top row (left to right): Kai Birket-Smith, Therkel Mathiesen, Helge Bangsted. Bottom row: Captain Peder Peterson, Knud Rasmussen, Peter Freuchen and Jacob Oleson. Birket-Smith and Jacob Oleson finished their explorations in Churchill. Photo from Peter Freuchen, Arctic Adventure, 1935. The central conclusion reached by Oleson, that arctic aboriginal pre-history had been theorized in an historical vacuum with respect to European developments, is difficult to resist. The evidence of extensive trade links with the central arctic, the possibilities of a more comprehensive nordic cartography than hitherto expected, and the sheer weight of Norse influence in the period under study, all suggest that Oleson may even have understated his case. The tendency for students of arctic prehistory to see the Norse presence as rather peripheral to main developments fails to accommodate the body of evidence provided and discussed by many scholars. Norse activities provided admirable prototypes for any aboriginal group seeking to extend its own capacity for mastery of the arctic seas and lands. Nor is it possible to believe easily that when artifacts dispersed they did so because a people migrated. But by such hypotheses, which is an attempt to trace tradition in time and space, one gets a prehistoric picture of invasions and mass movements of peoples, and wars, and by a pyramid of hypotheses, all the trappings of the historical picture. The tail of history wags the prehistoric dog. Defining boundaries between disciplines has become a serious 20th century problem for students and scholars. Like the weather, everybody talks about it but nobody seems to know what to do about it. There has been an impressive tradition of historical geography developing in Canada since the 1960s, through the focused studies of Bruce Trigger and Conrad Heidenreich on old Huronia, the work of A. J. Ray on the fur trade, and R. Cole Harris on old Quebec. As with many other elements of Canadian historical scholarship, this trend may be traced back to Harold Innis, who has been praised by two prominent historians of geographical thought for writing some of the best historical geography between 1930 and 1970. The labels are of course not the issue, but it is curious how certain fashions of research may settle on a discipline, only to resurface fifty years later in another discipline as something new. In retrospect, Oleson’s work should be seen as a major contribution in Canadian historical geographic studies. In the search for the origins of the cultural hearth of the Thule, and in attempting to assess its probable influence over space and time, Oleson was in good company. If knowledge is, as some suspect, the outcome of what transpires during the course of a most elaborate game, then perhaps Professor Oleson’s only sin was that he played the game too well. 1. A comprehensive synthesis was produced in 1964 in German by Hans-George Bandi, Urgeschicte der Eskimo (Stuttgart, Gustav Fischer Verlag). This appeared in English translation with revisions in 1969, as Eskimo Prehistory. Trans. Ann E. Keep, Univ. of Alaska, Studies of Northern Peoples, No. 2 (Seattle: Univ. of Washington Press). For a clear and well illustrated introduction to the general concepts of arctic prehistory see Robert McGhee, Canadian Arctic Prehistory (Ottawa: National Museum of Man, 1978). An important summary of the state of arctic pre-historic research, contemporary with the publication of Early Voyages and Northern Approaches was John M. Campbell, ed., Prehistoric Cultural Relations Between the Arctic and Temperate Zones of North America, Arctic Inst. of North America, Tech, Paper no. 11 (Montreal: 1962). 2. See Ronald J. Nash, The Arctic Small Tool Tradition, Dept. of Anthropology, Univ. of Manitoba, Occasional Paper no. 2 (Winnipeg: Univ. of Manitoba Press, 1969) pp. 1-3. For a systematic review of chronologies in the arctic, see any of the following: H. G. Bandi, Eskimo Prehistory, Don E. Dumond, The Eskimos and the Aleuts (London, Thames and Hudson, 1977); Moreau S. Maxwell, Prehistory of the Eastern Arctic (New York: Academic Press, 1985). 3. See Diamond Jenness, “A New Eskimo Culture in Hudson Bay” Geographical Review, 15(1925), pp. 428-37. 4. For a schematization of cultures and sub-cultures, periods of occupation, and geographic locations, see the Appendix in Bandi, Eskimo Prehistory, pp. 188-89. See also, H. B. Collins, ‘The Origins and Antiquity of the Eskimo’ in Smithsonian Inst. Annual Report, 1950 (Washington, D.C.: 1951), p. 425 f., W. S. Chard, ‘The Western Roots of Eskimo Culture’ Proceedings 32nd. Int. Congress of Americanists, 1958, pp. 81-87; M. G. Levin, Ethnic Origins of the Peoples of Northern Asia, Arctic Institute of N.A. Trans. no. 3 (Toronto: Univ. of Toronto Press, 1963); S. I. Rudenko, The Ancient Culture of the Bering Sea and the Eskimo Problem, Arctic Inst. of N.A. Trans., no. 1 (Toronto, Univ. of Toronto Press, 1961). 5. Franz Boas, The Central Eskimo (Washington, D.C.: Bureau of Ethnology, 1888). (Coles Reprint, 1974), pp. 634 f.
6. Cf. Tryggvi J. Oleson, Early Vintages and Northern Approaches 1000 - 1632 (Toronto: McClelland and Stewart Ltd., 1968) ch. 8, and Patrick Plumet, “Vikings et Tunnit: A propos de l’ouvrage de Tyrggvi J. Oleson” Inter Nord (1968), pp. 303-08. 7. Oleson, p. 54; 59. 8. A. P. McCartney, “Introduction” in A. P. McCartney, ed. Thule Eskimo Culture: An Anthropological Retrospective (Ottawa: National Musuem of Man. Mercury Series, no. 88, 1979), p. 3. 9. Therkel Mathiassen, “Review,” Scandinavica 3(2) (1964), pp. 147-48. 10. William E. Taylor Jr. “Review,” Arctic (March, 1964), pp. 61-62. William E. Taylor Jr. “The Fragments of Eskimo Prehistory,” The Beaver (Spring, 1965), pp. 8-9. 11. Taylor, “The Fragments of Eskimo Prehistory,” pp. 8-9. 12. Taylor, “Fragments,” p. 9. 13. Wilcomb E. Washburn, “Review,” New Jersey Historical Series, Smithsonian Institution (April, 1965), pp. 802-03. 14. W. L. Morton, “Obituary Notice: T. J. Oleson,” Transactions of the Royal Society of Canada (1964), pp. 802-03. 16. Henry B. Collins, “The Origins and Antiquity of the Eskimo,” in Smithsonian Inst. Annual Report, 1950, Washington, D.C., 1951, p. 425. 17. Cf. Grahame Clark, The Stone Age Hunters (London: Thames and Hudson, 1967), pp. 92-111; Grahame Clark, World Prehistory: A New Outline, (London: Cambridge U.P., 1969), pp. 79-82; V. Gordon Childe, The Dawn of European Civilization, 6th Ed., Revised (New York: Random House, 1964) pp. 10-12; Geoffrey Bibby, The Testimony of the Spade: Life in Northern Europe from 15,000 B.C. to the time of the Vikings, (New York: A. Knopf, 1956), Chapters 10 and 11. 18. Clark, Stone Age Hunters, p. 106. 19. Bibby, Testimony of the Spade, pp. 165-68. 20. Edward Weyer Jr. “Eskimo Prehistory in Perspective,” Polar Notes, no. 1 (Nov. 1959), pp. 71-78. 21. See S. I. Rudenko, “The Ancient Culture of the Bering Sea and the Eskimo Problem,” trans. by Paul Tolstoy, Arctic Inst. of North America. Anthropology of the North, trans. from Russian Sources, no. 1 (Toronto: Univ. of Toronto Press, 1961), and C. S. Chard, “The Western Roots of Eskimo Culture,” Proceedings, 32nd Int. Cong. of Americanists, 1958, pp. 81-87. 22. Cf. H. G. Bandi, Eskimo Prehistory; D. Dumond, The Eskimo and the Aleuts; Smithsonian Inst. Handbook of North American Indians, Vol. 5, The Arctic (Washington, D.C.: 1984) pp. 8-22, pp. 359-76. On the actual importance of whales in the later Thule culture see also the debate between M. M. R. Freeman and A. P. McCartney. Cf. M. M. R. Freeman, “A Critical View of Thule Culture and Economic Adaptation” in McCartney, ed. Thule Eskimo Culture, pp. 278-85; and A. P. McCartney, “The nature of Thule Eskimo Whale Use,” Arctic 33(3) (1980), pp. 517-41. 23. The most up-to-date analysis of the orthodox view of Thule culture expansion is to be found in Moreau S. Maxwell, Pre-history of the Eastern Arctic (New York: Academic Press, 1985). A lucid summary of the general position and interpretation may be found in Robert McGhee, “Thule Prehistory of Canada” in Smithsonian Inst. Handbook of North American Indians, Vol. 5, pp. 369-76. 24. See particularly the documentation provided in Chapters 7,8,9,10,11. It is difficult to agree with the assertions made by Taylor and Quinn that Oleson had played down the arguments of archaeologists. Quinn makes the remarkable statement that “these startling theories are set out mainly as interpretations of the literary sources with only limited acknowledgement of the extensive archaeological and ethnological work which has been done on Greenland and the Arctic generally.” The contrary is the case in the chapters mentioned above. 25. Bandi, Eskimo Prehistory, p. 149; Freeman, “A Critical Review of Thule Culture”; Brian W. D. Yorga, “Migration and Adaptation: A Thule Culture Perspective” in McCartney, ed., Thule Eskimo Culture, p. 287; Oleson, Early Voyages, p. 60. 26. Oleson, Early Voyages, pp. 60-61. 27. Oleson, Early Voyages, p. 60; Washburn, “Review,” p. 802. 28. Oleson, “Polar Bears in the Middle Ages,” Canadian Historical Review, 31 (1950), pp. 47-55; “The Vikings in America” Canadian Historical Association Report (1954), pp. 52-60; “The Vikings in America: A Critical Bibliography” Canadian Historical Review 36 (1955) pp. 166-73; Early Voyages, ch. IV; “Vikings-Eskimos-Tunnit” in R. S. Hoyt, ed. Life and Thought in the Early Middle Ages (Minneapolis: Univ. of Minnesota Press, 1967). 29. Carl O. Sauer, Northern Mists (Berkeley: University of California Press, 1968), pp. 152 f., and Cf. Oleson, “The Vikings in America”; “The Vikings in America: A Critical Bibliography”; Early Voyages, Ch. IV. 30. A. H. Clark, “Review,” Geographical Review 55 (1965), p. 619. 31. Melvin H. Jackson, “Review,” William and Mary Qty. 23(3) (1966), p. 173. 32. Cf. Robert Latouche, The Birth of Western Economy: Economic Aspects of the Dark Ages (New York: Harper, 1961), p. 211 f.; E. M. Carus-Wilson, Medieval Merchant Ventures: Collected Studies 2nd ed. (London: Methuen, 1967), chapters I and II. 33. Cf. Latouche, Birth of Western Economy, p. 227. 34. While no comment will be offered on the validity of the recent studies by Barry Fell, the most radical interpretations of European Bronze-Age influence abroad in the period after 1000 B.C. (and particularly influences from the Scandinavian heartland) are to be found in his works, America B.C., Saga America, and Bronze Age America. While traditional archaeologists do not look fondly on such works, Fell and his colleagues work from real evidence. That the tide is turning in favour of making room for these ‘radical’ theories of pre-columbian contacts can be seen from the new respectability given to them in standard university texts. See, for example, the chapter by Stephen C. Jett in Jesse D. Jennings, ed. Ancient North Americans (New York: W. H. Freeman, 1983). 35. Karen Larsen, A History of Norway (Princeton: Princeton Univ. Press, 1948) pp. 73-74; William Scoresby, An Account of the Arctic Regions with a History and Description of the Northern Whale Fishery, Vol. 2 (London: 1820), Ch. 1; Fridtjof Nansen, In Northern Mists (London: W. Heinemann, 1911) Vol. 1, p. 172; Vol. 2, pp. 155-59. 36. Helge Ingstad, Land Under the Pole Star, (New York: St. Martin’s Press, 1966), p. 75. 37. Mathiassen, “Review,” p. 148. 38. On the place of the Norse in general European trade patterns during the so called ‘Viking Age’ see Per Sveas Andersen, Vikings of the West: The Expansion of Norway in the Early Middle Ages (Oslo: 1971), chapters III and IV; and Archibald R. Lewis, The Northern Seas: Shipping and Commerce in Northern Europe, A.D. 300-1100 (Princeton: Princeton University Press, 1958). 39. Inge Kleivan, ‘History of Norse Greenland’ in Smithsonian Inst. Handbook of the North American Indians, Vol. 5: Arctic (Washington: Smithsonian Institution, 1984), p. 557. 40. 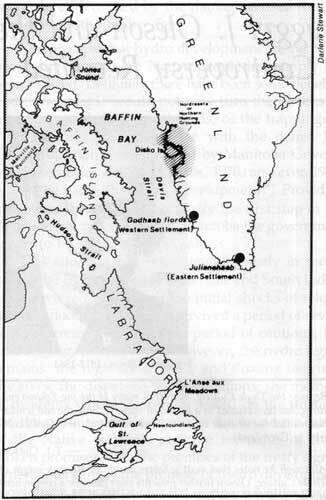 T. H. McGovern, “The Lost Norse Colony of Greenland,” in E. Guralnick, ed. Vikings in the West (Chicago: Soc. of American Archaeology, 1982), p. 555. 41. Cf. Andersen, Vikings in the West, and Lewis, The Northern Seas, and George Nellerman, “Caribou Hunting in West Green-land,” Folk 11-12 (1969/70), pp. 133-53. 42. Oleson, “Polar Bears in the Middle Ages,” pp. 47-55. McGhee has argued that some of the evidence cited in this connection may not be Eider Duck shelters but slab hearths dating to the Paleo-Eskimo period. Cf. Robert McGhee, “Norsemen and Eskimos in Arctic Canada,” in Guralnick, ed., Vikings in the West, p. 49. But see also Helge Ingstad, Land Under the Pole Star, pp. 94-97. 43. For an interesting and sometimes provocative interpretation of arctic cartography, including the proposition that significant contributions were made to cartography by Inuit, see J. R. Enterline, Viking America: The Norse Crossings and their Legacy (Garden City, N.Y.: Doubleday, 1972), ch. 5. 44. See Finn Gad, The History of Greenland 2 v. (London: Hunt, 1970) and V. Stefansson, Greenland (New York: Doubleday, 1942). 45. V. Stefansson, ‘The Disappearance of the Greenland Colony’ in Unsolved Mysteries of the Arctic (New York: 1956), p. 18. 46. Sauer, Northern Mists, p. 153. 47. Compare Oleson, Early Voyages and Northern Approaches, “Foreword” to the 1968 Reprint p. xiii and Stefansson, “Introduction” to The Three Voyages of Martin Frobisher (New York: Argonaut Press, 1938). 48. Quinn, “Review,” p. 48. 49. Compare Quinn “Review,” p. 45 and Oleson, Early Voyages, pp. 79-80 and Stefansson, “Introd,” Three Voyages of Martin Frobisher, pp. lxv-lxvi; Voyage I, p. 166; Voyage p. 19. 50. Cf. William H. McNeill, The Rise of the West: A History of the Human Community (New York: New American Library, 1963), p. 655 f.; and on the new world context see for example, Cornelius Jaenen, Friend and Foe: Aspects of French-Amerindian Cultural Contact in the Sixteenth and Seventeenth Centuries, (Toronto: McClelland and Stewart, 1976), p. 161 f.; Marcel Giraud, The Métis in the Canadian West, George Woodcock, trans., (Edmonton: Univ. of Alberta Press, 1986, Vol. 1, ch. 6 and ch.7. 51. Cf. Giraud, The Métis, p. 311. 53. Quinn, “Review,” p. 48. 54. M. S. Maxwell, Prehistory of the Eastern Arctic, (New York: Academic Press, 1985), p. 132. 55. E. Bielawski, “Contractual Transformation: The Dorset-Thule Succession,” in A. P. McCartney, ed., Thule Eskimo Culture, p. 103. 56. Robert McGhee, “Norsemen and Eskimos in Arctic Canada” in Guralnick, ed., Vikings in the West, p. 46 f. On iron generally, see also, A. P. McCartney and J. D. Mack, “Iron Utilization by Thule Eskimos of Central Canada,” American Antiquity (38(3) (1973), pp. 328-38; T. H. McGovern, “Thule-Norse Interaction in Southwest Greenland: A Speculative Model,” in A. P. McCartney, ed. Thule Eskimo Culture, pp. 171-88; Sauer, Northern Mists p. 151 f.; Peter Schledermann, “Notes on Norse Finds From the East Coast of Ellesmere Island, N.W.T.,” Arctic 33(3) (1980), pp. 454-63; Peter Schledermann, “Eskimo and Viking Finds in the High Arctic,” National Geographic (May, 1981), pp. 575-601; Robert McGhee, “Why Did the Vikings Leave?” Rotunda (winter, 1987), pp. 42-48. 57. Oleson, Early Voyages, p. 61. 60. Cf. William S. Laughlin and William E. Taylor Jr., “A Cape Dorset Culture Site on the West Coast of Ungava Bay,” National Museum of Canada. Bull. No. 167, (Ottawa: 1960) pp. 1-15 and T. E. Lee, “Archaeological Discoveries, Payne Bay Region, Ungava,” Univ. of Laval, Centre D’Etudes Nordiques, no. 20, (Quebec: Univ. of Laval, 1968), and subsequent reports. 61. See John Doig, “Storm Over Ungava,” Anthrop. J. of Canada 21(1983), pp. 18-28; Thomas E. Lee, “The Norse in Ungava,” Anthrop. J. of Canada 4(2) (1966), pp. 51-54; Thomas E. Lee, “Archaeological Investigations of a Longhouse, Pamiok Island,” Collection Nordicana, Centre d’Etudes Nordiques, No. 33, Laval Univ. 1970; Lee, “On the Trail of the Northmen,” The Beaver, (Winter 1983). 63. T. E. Lee, “Review,” Culture, 28 (1), 1967. 64. Oleson, Early Voyages, pp. 84-85. 65. Oleson, Early Voyages, pp. 82 f.; H. B. Collins, “Stefansson as Anthropologist,” Polar Notes No. IV (Nov. 1962), pp. 8-13; D. Jenness, “The Blond Eskimos,” American Anthropologist, N.S. XXIII (1921), pp. 157-67. Robert McGhee, Copper Eskimo Prehistory, Pub. in Archaeology, no. 2, National Museums of Canada, (Ottawa: 1972), pp. 1-5, 125-30. Stefansson’s reply to critics came in an appendix to the 1927 edition of My Life with the Eskimo, abridged edition (New York: MacMillan, 1927). 66. See in particular Emoke J. E. Szathmary, “Human Biology of the Arctic,” in Smithsonian Inst., Handbook of North American Indians, Vol. 5, The Arctic, pp. 64-71. The most up-to-date treatment of general problems concerning physical anthropology and the peopling of the new world from Asia is W. S. Laughlin and Albert B. Harper, The First Americans: Origins, Affinities, Adaptations (New York: G. Fischer, 1979). A recent and exhaustive look at the evidence provided by physical anthropology for the general support of the west to east migration model in the high arctic is to be found in C. J. Utermohle, From Bar row Eastwards: Cranial Variation in the Eastern Eskimo, (Ph.D. Thesis, Arizona State Univ., 1984). 67. Cf. J. Doig, “Storm Over Ungava,” and Lee, “On the Trail of the Northmen” but also, McGhee, Copper Eskimo Prehistory, and the general discussions provided in the Smithsonian Institution, Handbook Vol. 5. In the Handbook the general body of literature arguing for a substantial medieval European influence on arctic populations is little discussed and scarcely acknowledged. 68. Inge Kleivan, “History of Norse Greenland,” in Smithsonian Institution, Handbook p. 554. 69. Oleson, Early Voyages, ch. 11; Stefansson, Unsolved Mysteries, ch. 1 and Stefansson, ed. “Introd.,” The Three Voyages, pp. xxvi-xxxi. 70. Stefansson, ed. “Introd.” The Three Voyages, p. lxx. 71. Quinn, “Review,” p. 48. 72. Stefannson, Unsolved Mysteries, p. 11-12. 73. Cf. William H. McNeill, Plagues and Peoples, (Garden City, New York: Anchor, 1977), “Introd.” and ch. V.
74. On the trade relationships and craft traditions current amongst Scandinavians after A.D. 750 see P. H. Sawyer, Kings and Vikings (London: Methuen, 1982), ch. 8, Latouche, Birth of Western Economy and Andersen, Vikings in the West. 75. Oleson, Early Voyages, pp. 71-3, and Gwyn Jones, The Norse Atlantic Saga, 2nd ed. (London: Oxford, 1984), p. 74. 76. Cf. Carl Sauer, “Foreword to Historical Geography,” in John Leighly ed. Land and Life: A Selection from the Writings of Carl Ortwin Sauer (Berkeley: Univ. of Cal. Press, 1963) pp. 358-65; and Preston E. James and Geoffrey G. Martin, All Possible Worlds: A History of Geographical Ideas, 2nd ed. (New York: John Wiley, 1981), pp. 325-26. 77. Don Bothwell and Eric Higgs, ed., Science in Archaeology: a survey of progress and research, 2nd ed. (London: Thames and Hudson, 1969), p. 34. 78. Cf. Lewis R. Binford, “A consideration of archaeological research design,” American Antiquity 29(4) (1964), pp. 425-41; and Colin Renfrew, “Foreword” to Lewis R. Binford, In Pursuit of the Past: Decoding the Archaeological Record (London: Thames and Hudson, 1983), pp. 7-9. 79. Karl W. Butzer, Environment and Archaeology: An Introduction to Pleistocene Geography (Chicago: Aldine, 1964); and Archaeology as Human Ecology (London: Cambridge University Press, 1982). 80. On Barrows, see James and Martin, All Possible Worlds, pp. 324-25.